The thought this time was a drink to celebrate autumn; even though it was 85 degrees today. Jess had recently prepared the FoodMayhem pumpkin puree, most of which went into her amazing pumpkin lasagna. It was glowing orange in the fridge; calling out to me much like the green crystal calls to Superman. However, instead of drawing me to the north pole, this drew me to the liquor store, where I bought a spiced rum, Cruzan 9 Spiced Rum, a good, inexpensive rum for cocktails. The night before I experimented a bit and tried combining with Bruce Cost’s amazing ginger ale; but the result was cloying and I used too much cinnamon. With guidance from Jessica’s sensitive palette, I refactored the drink into the current incarnation. We are quite pleased with the results. The feedback from our “tastebud” guests was overwhelmingly positive. A very drinkable cocktail where you can taste the rum and it’s not too sweet, it inspires tastes of the fall and everyone felt it tasted familiar yet new. Jason thought it could use more pumpkin, so feel free to experiment. 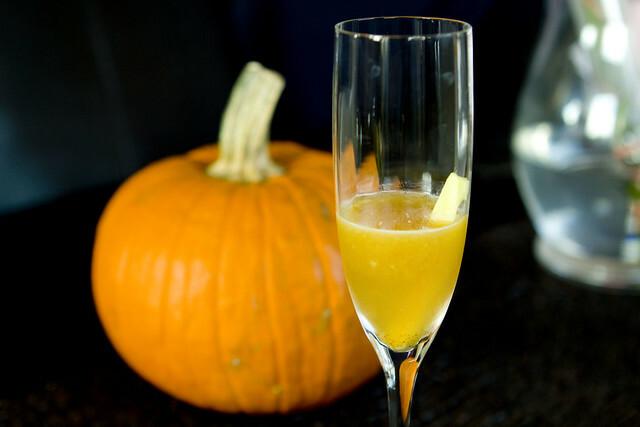 In this drink the pumpkin flavor is not strong, but rather serves to thicken to drink making a very smooth consistency without savory hints. Give this drink a shot (pun intended) and let us know what you think! Update: since we first wrote this, we served the same drink to more guests to again generally favorable feedback. We have a winner. 1. Toast spice mix in a dry pan until fragrant. Remove pan from heat and add freshly grated ginger and pumpkin puree. Stir well to combine. 3. 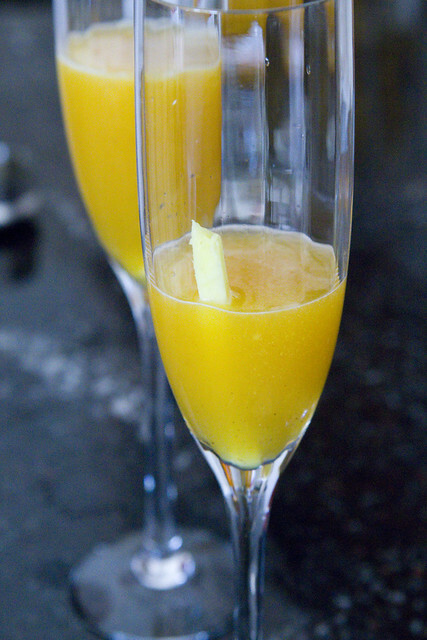 Strain into a champagne flute or cordial glass. Garnish with a stick of fresh ginger. posted by Lon	at 08:49 PM	Filed under Cocktails and Liquor, Drinks, Holidays. You can follow any responses to this entry through the RSS 2.0 feed. Both comments and pings are currently closed. Oh I was hoping to find a pumpkin cocktail. I say this all the time. Why do we honor the flavors just a few months of the year? This deserves more than that.